The 620-year-old solid piece of iron is as heavy as it looks. Examining this brutally simple hand cannon, it's hard to imagine that virtually all modern weaponry, and the tactics required to effectively utilize them, stem from weapons like this. They revolutionized the way armies fought wars and heralded the end of the medieval period and beginning of the Renaissance. But why is a weapon probably made in Germany in the 1390s in the National Museum of American History? The museum's hand cannon, ca. 1390. It weighs about 35 pounds. The cannon is approximately 40 inches long/tall, 3 inches wide at its widest point, the barrel itself has a diameter of approximately 1 inch. Department of Armed Forces History. The hand cannon became part of the museum's collection back in 1978, when the museum was called the Museum of History and Technology. With its hook used to steady the weapon on a castle's wall and formidable impact on weapons history, the hand cannon fit perfectly with the museum's original goal of highlighting technological development throughout history. When the museum changed its name to the National Museum of American History in 1980 to focus on the specific history of the American people, the weapon remained relevant to the collection because of its influence on the overall development of the firearm, which has proved crucial to the development of our nation. This year, as we celebrate the museum's 50th anniversary in an era of extremely advanced weaponry, I think the hand cannon is even more relevant than ever. The medieval period was known for its especially horrifying battle conditions. Deadly disease, famine, and weapons that relied on massive blunt force trauma were but a few of the ways a soldier could meet his end during this age. With the introduction of the first practical firearms by the end of the 14th century, things started to get a whole lot more evil. In this new environment, not even the most expensive or well-made armor could ensure a soldier's safety. These early firearms, known as hand cannons, revolutionized the way armies fought wars and heralded the end of the medieval period and beginning of the Renaissance. A 15th century painting depicts hand cannons in action. The army besieging the fortified town in this work employs bows and arrows, crossbows, cannons, and hand cannons, reflecting the wide range of weapons systems used in European warfare at this time. 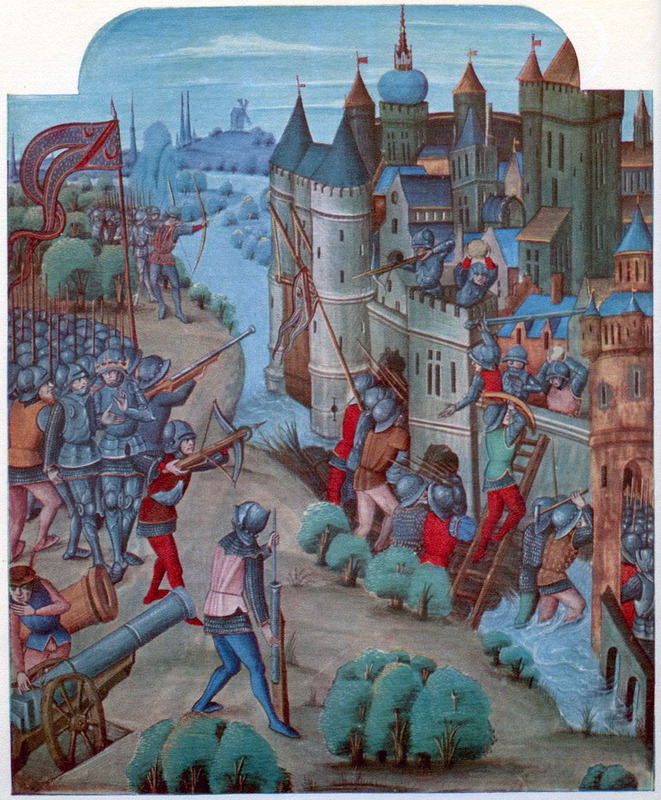 Mentions of early cannons in Europe start to appear in the historical record during the early 1300s. By the turn of the 14th century, these rare and cumbersome machines had been successfully miniaturized so only one or two soldiers were required to operate them. Gunners rammed gunpowder and the projectile, anything on hand ranging from arrows to specifically made lead balls, down the muzzle of the barrel. One soldier aimed the weapon while another lit the gunpowder with a piece of hot iron or a slow burning match. Early hand cannons were extremely inaccurate due to the volatility of gunpowder, imperfections during the manufacturing of the gun itself, and weight of their solid iron barrels. However, the psychological impact of the loud explosion and brute power of the gunpowder made up for what they lacked in precision, especially at close range. Filipinos fighting the United State Army resorted to making their own firearms. This handmade gun from around 1900 harkens back to the hand cannon. The gun was muzzle-loaded and the charge was set off by applying fire to a touchhole in the side of the barrel. As hand cannons became more widespread throughout Europe, the nature of warfare itself began to change. The adoption of advanced weaponry required specially trained soldiers to use them, gradually replacing the medieval practice of minimally trained peasant armies. Now, leaders had to invest in well trained standing armies to give themselves the upper hand against their enemies. Additionally, to ensure they had access to the latest and greatest weapons, rulers began to invest their money into science and technology. These changes in attitude contributed to the beginning of the age now known as the Renaissance. When you see news reports with American soldiers using rifles that can see through walls or hit a target over a mile away, just remember where they all came from, a solid iron hollowed out rod that looks like it belongs in a scrap metal yard. Samuel Florer was an intern in the Department of Armed Forces History. He is a a senior at the College of William and Mary. Learn more about our internship opportunities.